Here we are at SALT. We Loved this wall of photos that was a compilation of different faithful women in our lives, which is pretty neat. 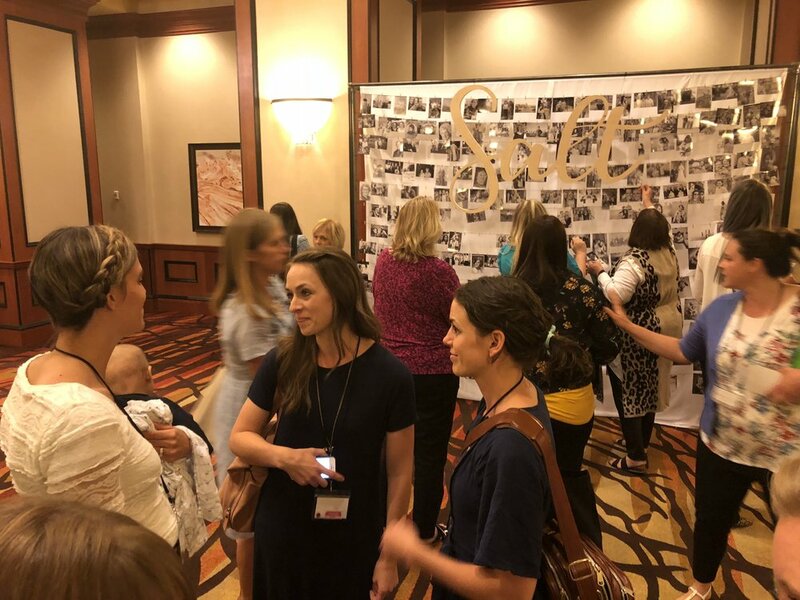 Kristin and I (Laura) had the opportunity to speak at an amazing lds women’s retreat called SALT in Salt Lake City, Utah. Wait what’s SALT? It’s a full day retreat where women get together to connect, feel the spirit and draw closer to their Savior Jesus Christ. There we got to discuss one of our favorite things to talk about: Making Time for What You Love! Here’s some behind the scene photos and the main things we talked about in case you couldn’t make it! Here we are at the round table discussions, having a good laugh about something. What makes you more YOU? We believe making time to do what inspires and energizes us helps us be our best selves. We discussed how to bring the creativity and hobbies you love into your life in a way that brings you true joy and fulfillment — even when you have a packed schedule. We explained how powerful Joy can be and that we were created for Joy! There is a reason we feel called to do and love certain things! We can access God’s power and grace to help us magnify our efforts! I think our biggest take away from our discussions were that we each have been given unique gifts and interests to helps us feel joy in this life and they look different for everyone! Even if we have the same interests we do them in such a different way that there is room for all of us! Their answers didn’t surprise us…Not enough time, balancing family and work, negative thoughts, indecision, doubt, guilt, feeling inadequate etc. Those answers were amazing…Wholeness, peace, contentment, excitement, wonder and joy. We love that message and we’ve found that when we come unto Christ and access God’s power and grace then our efforts our magnified and the results are better then we could have ever imagined. We hope we don’t forget to stay close to Christ so that we can always have his help. We made a free cute & helpful little HANDOUT with three great questions to ask yourself + our favorite resources on the topic. In case you missed our discussion or want more help on this topic, we are sharing our detailed NOTES with you for free! There were so many amazing women we got to talk with! Want to get a hold of Laura & Kristin's NOTES? We’ll send you our detailed notes on Making Time for What You Love for free! Met so many wonderful women! It was such a great experience and we are still in awe at all the incredible women we met that day! It’s refreshing to know there are so many women out there who, like us, want to live life with more purpose, creativity and joy! !